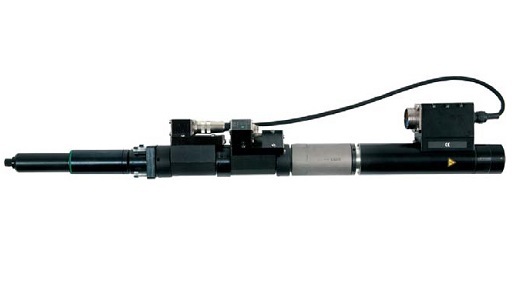 Stationary screw spindle DGD BB - single cable version is a modular screw system for torque- and angle-controlled stationary applications as well as function-critical and safety-critical screw connections that require documentation. The system is based on brushless, electrically commutating EC motors. The drive modules offer a torque of up to 1600 Nm in four performance classes and are also available with reversing gear units to shorten the installation length. The gearboxes are equipped with planetary gearboxes with different gear ratios, torque and angle-of-rotation sensors, various outputs as well as springy key heads. The transducers can also be installed in duplicate for maximum process reliability. The possibility of attaching the drives to the screw in a 15 ° division allows for use in very confined spaces. The controller m-Pro 400S, which is integrated in a compact housing together with the power parts TM, adapted to the tool size, or implemented as a standard control cabinet, is used for control purposes. Operation is via a touch-screen panel with graphical user interface and menu navigation. The control system can be used to program all current torque, rotation angle and stretch limit screw processes, as well as complex tightening methods. The DGD-BB modular installation routers are delivered in four grades graded according to torque. The drive modules are available with or without reversing gear. A typical field of application is the assembly of motor assemblies, for example, cylinder heads, motors, gearboxes, clutches, axles, drive shafts or springbrakes. The most important users are the automotive supply and automotive industry.